This blog post is the second in our series about professional coaching skills for agile coaches. If you have not yet read the first blog post: "Listen, be curious and ask the great questions! ", we suggest you to read that one before continuing here. Asking the right questions is a challenging task. Especially when you do not want to pose your own opinion on to the person or team you are talking with. Great coaching questions are open-ended, non-judging and helps to foster new ideas and visions about possibilities. These kind of questions we call powerful questions. There are several approaches to practicing powerful questions. They depend on which coaching school you are coming from. One approach is to practice a deck of questions until you know them by heart thereby being able to choose the right one in a given situation. Another approach is to learn a strategy on designing the right question in the moment. This strategy comes out of a model developed by the Canadian psychologists Karl Tomm. The approach of Karl Tomm have the roots in systemic theory. It encapsulates circularity and the understanding that each of us has a different view upon the facts about a given situation. No one has monopoly on the truth. The model pictured below shows two dimensions: Time and understanding. 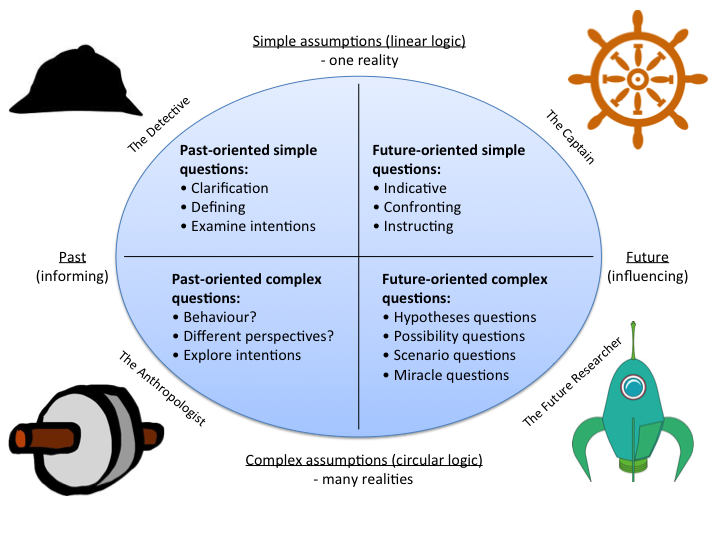 The past vs the future on the horizontal axis and simple vs complex understandings on the vertical axis. Some of our powerful questions are aimed at what have already happened and some are aimed at what could happen. Some of our powerful questions presume that there is one and only one truth (linear questions) and some acknowledge the diversity in our understanding of the truth (circular questions). When we ask questions that are past-oriented and linear, we ask questions like a detective in an interrogation: "What happened? ", "Who did what? ", "Who's fault is it? ", etc. Here we are looking for facts that helps us understand the issue. When we ask questions that are past-oriented and circular, we ask questions like a anthropologist doing his research: "What do you think was their motivation to do so? ", "From which point of view could the action he did, make sense? ", "Could it be that she saw something that the rest of you did not realize? What could it be? ", etc. We are looking for intentions and expanding our understanding of the intentions. Questions twe ask as future-oriented and circular questions have the intention of exploring opportunities and expanding possibilities. Here we ask questions like a future researcher. We might also ask questions that suggests that a miracle has happen over night: "If you come to work tomorrow and the problem has disappeared over night, how would you notice? ", "When you in three months have solved this matter and look back on today, which decisions did you make that made a difference? ", etc. Questions in this category might seem a bit strange at first, but give it a try. The advantage of questions like this is that they disconnect the person or team in front of you from the constrained situation they are currently, freeing up energy to see new perspectives and decide new cause of actions based on those perspectives. They help the person or team in front of you to see which part of the miracle or the desired future are already present today and how they can be used as stepping stones towards the goal. Finally, we can ask simple or linear future-oriented questions. They are questions that captain would ask. They are more directive and serve the purpose of setting direction for the wanted change: "What is the first thing you are going to do? ", "Who will you talk to?" and "How can he or she help you?". Like in a retrospective, this is where the specific tasks are defined and prepared for action. When coaching someone, we are mostly looking at the future and the change we are going to make. However, from time to time we must look back to the past to understand what have happened and why we are in the current situation. It is like driving a car: We are mostly looking out the windshield at the traffic in front of us, but from time to time we also look in the rear mirror to know what is behind us. There is no specific route you must follow when using the model of Karl Tomm. Personally, I find that most of the time I start as a detective, then become an anthropologist, then investigate as the future researcher and finally ending as the captain. But on my way, I may jump back and forth when my intuition tells me to. Asking powerful questions is a valuable tool you can use as a coach, and with practice you cab in time be fluent in this approach. Read the third and final part in this series, "Have a structure for your coaching conversation". Listen, be curious and ask the great questions! People, and helping people to success is the most important matter to me. I think that agile is a great platform to achieve this - that is why I became a coach. I am a member of the agile42 coach team, based in Denmark, and as a CSC and CST I coach and train people in Scrum and agile approaches. I coach from systemic principles and have the quest of bringing agile to embedded product development.